While working on a sewing project it is always important to finish it off with a nice touch! After spending hours working on that cute Christmas dress for your granddaughter, you want to finish it off strong and make sure none of the edging is sloppy or awkward. A good way to do so is by using a facing. In this article you will learn about the different types of facing, what they’re good for and the best ways to do it! The facing is a piece of fabric or material, which can be fun and colorful or patterned to match your project, that is then cut to be sewn on the raw edges of the project. These raw edges include areas like necklines, arm holes, etc. If you are using shaped facings, these are sewn on to face the direction of the edge of your project. This will include things like adding a strip of colorful fabric on the inside of the dress’s neckline to hide your stitching. Using biased facings will result in you using fabrics that are cut along the bias and then sewn on and shaped to fit the edge. 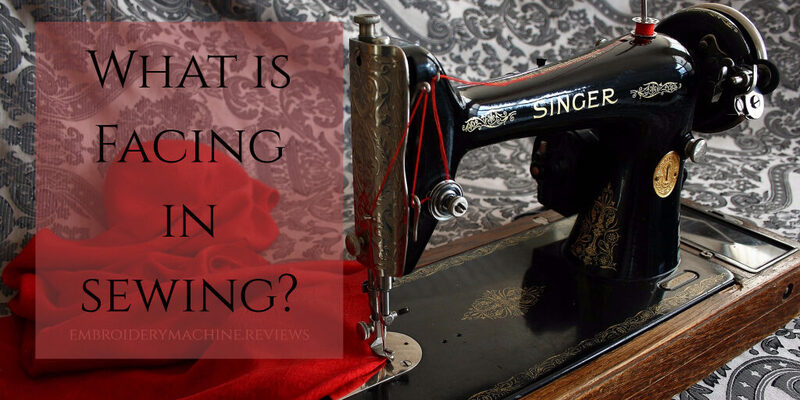 This includes tasks like cutting a piece of fabric similar to the neckline of your project and sewing it on and shaping it to fit the neckline. This will hide your seam and be folded over the edge of the neckline and sewn on. Using a facing on any project will give a more clean-cut and professional finish. This will also hide any loose ends of fabric as well as the seams. Although facing is widely used in clothing, you may also use it on other projects to give them that refined look as well. These sorts of projects include things like quilts, curtains, and even table cloths! If you are worried about creating a facing for your project, worry no more! The easiest way to achieve your goal is to simply recreate the line work of the piece you are facing by using your original pattern. Another helpful tidbit is to learn about bias tape. Bias tape can be used with your facings by applying it to the edges in order to pull them in and keep them bound together. This will take place in the inside of your facing. You can create your own bias tape at home using a bias tape maker, which is available at any large sewing retailer, or you can buy the tape in larger quantities as well. In choosing your method be sure to keep in mind that using a bias tape maker can be a little difficult as you must cut the fabric in a certain way in order to properly make your tape. While facing can be tricky at first, being prepared is always helpful! There are many tutorials and videos available online to teach you how to properly add facing to your projects. Practice makes perfect, so don’t be afraid to test out facing on some spare material before working it into your projects. If you’re still having problems with your facing, take your project to a local tailor for recommendations and help!